​Helpful Tip: For best results, make sure to photograph your wall standing directly head on and center to where the painting will hang. Include the dimensions of your wall and sofa, if applicable. Please contact me for current pricing and availability of the pieces shown on this site. Other pieces which are not shown may also be available. 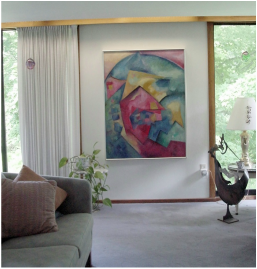 I have continued to work for over 30 years with Art Consultants, Galleries and private collectors, and am flexible in my pricing for public and private commissions. Please view my resume’ to view a select list of corporate clients that have purchased or commissioned my work. My studio is located conveniently at the Delavan Center, with plenty of visitor parking, in the attractive Syracuse, New York’s connective corridor. I am usually at my studio working daily and you may visit by appointment. Please contact me to discuss a commissioned work with your design requirements, and additional information on the production time, and shipping. Following is a list of workshops I have designed and taught. Please inquire if you are interested in any or all of these workshops. Location of workshop depends upon enrollment and request. Materials and Techniques: Painting, Collage, Printmaking, Encaustic, Mixed Media and Sculpture. Process: a demonstration, of a selected medium, with hands on student participation in material handling, application and process orientated art-making techniques. The Business of Art: Seminar in the production and economy of art. Discussion and guidance in resume’ building, juried exhibits, museum shows, curated exhibits, non-profits and commercial gallery and agent representation. Creating a Virtual Presence in the Art world: Seminar will focus on the various ways an artist can use the computer and the internet to create work as well as expose their artwork to the public. Web design, social media, mass marketing and networking in the art world will be presented along with software applications used by artists to create and/or enhance their work. Artist Studio and Gallery Visit: Students will be invited to visit the “Artist in Residence” working studio to view works in progress and explore some of the venues available to professional working artists today. Linda Bigness at Studio 245 located at 509 W. Fayette St., Syracuse, New York is offering an Encaustic workshop (fill out request form for more information. The workshop is for artists of all levels interested in the art of encaustics (hot wax painting). The one day, 6 hour, introductory workshop will offer the basics of the art form and the hands on experience of creating a small piece with an introduction of materials and overview of techniques. Acknowledgement: Over the years many students and apprentices have crossed the threshold into Studio 245 and have studied under the influence of Linda Bigness. Following are names of artists, teachers, students and others who have spent at least a year or more in their formative creative years studying the styles and techniques of Linda Bigness's work. Perhaps you will see some of this influence in work they create today.